Weight loss shakes can be a big help when you’re trying to lose a few pounds and don’t have the time to cook and prepare healthy meals. They give you the protein and nutrients you need to rev up your metabolism while keeping you full without a lot of calories. Plus, they are convenient to take with you on the go. However, not all shakes are created equal. In this article, we will discuss what to look for in a meal replacement shake, how to best utilize them for weight loss, and review some of our favorites of 2019.
Who should drink weight loss shakes? As the name suggests, weight loss shakes are primarily for those looking to lose weight, but they can also be used as a meal replacement when you just don’t have time to cook a healthy meal. Regular protein shakes can make a great meal replacement depending on your goals, but specialized weight loss shakes typically have more nutrients and fewer calories which make them more effective at kick-starting weight loss. People looking to drop a few pounds would be wise to leverage a weight loss shake once per day, in addition to a good workout regime and healthy diet, to see faster results. How much protein should my shake have? Again, this depends on your goals. I usually recommend aiming for at least 20 grams of protein per serving when it comes to protein shakes. However, weight loss shakes sometimes have less so that they can keep the calories lower, and there is nothing wrong with that. If you are on a calorie restricted diet, go for a minimum of 10 grams of protein per serving so that you can stay full and keep your muscles fed while still keeping your caloric intake low. Can weight loss shakes replace all my meals? No. Weight loss shakes/meal replacements are typically meant to replace one meal per day, not all of them. Whole foods are still the best way to get important nutrients in the right ratios and it is still important to eat healthy, well-balanced meals in addition to the shakes or you risk negative health effects. They are called a “supplement’ for a reason. When should I drink the shake? Weight loss shakes can be utilized as a replacement for breakfast, lunch, or dinner, but I almost always recommend choosing breakfast or lunch. Often times when people skip dinner and drink a weight loss shake instead, they find themselves very hungry when bedtime rolls around and this can lead to binge eating. If you are on a resistance training program they can also make a good post-workout shake, although in this case you’ll want to increase your protein intake and be sure to compensate for the additional calories when planning out your other meals for the day. After trying nearly two dozen different brands of weight loss shakes my team has compiled the top 10 results below. Results based on quality of ingredients, taste, cost, and results. Comprehensive Fruit and Vegetable Blend: Instead of depriving your body of key vitamins and minerals, you can skip a meal and still get a boost of vitamins and minerals, thanks to the comprehensive blend of 12 non-GMO fruits and veggies that is in every serving of RSP TrueFit. This fruit and veggie blend delivers 16 vital vitamins and minerals to your body to help keep it running in tiptop condition. 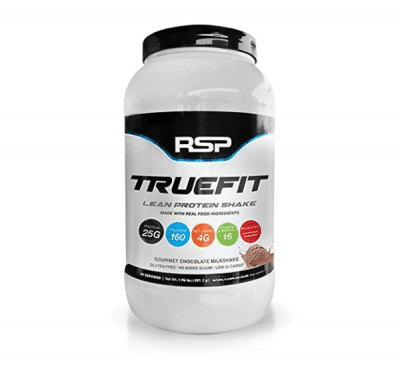 Packed With Protein: Each serving of RSP TrueFit contains a whopping 25 grams of lean protein, which makes up a significant portion of your daily protein needs. 1 serving of RSP Truefit has the same amount of protein as 1 cup of plain greek yogurt, but it tastes way better and can replace an entire meal. Protein is key to muscle growth, and lean protein is especially good for toning up your body without getting huge muscles. Promotes Digestive Health: Large amounts of protein or sudden changes in your diet can prompt some digestive issues. If the balance of your gut gets thrown off it can lead to irritability and discomfort. That’s why I love the digestion blend that is added to this powder, containing probiotics and enzymes that make for a happy gut. This shake is good for everyone and comes in 4 different flavors, including an unflavored option, to suit your personal taste.RSP TrueFit is without a doubt one of the best meal replacement shakes on the market, the only possible downside would be its price. But I think anyone who tries it would agree that it’s worth every dime after seeing all of what it has to offer. It’s one of the more pricey options in this list. And at 20 servings per container, you’ll need to be refilling about every 3 weeks assuming you’re replacing one meal per day. That said, at ~$1.50/serving you’re still saving a lot of money (and time) in comparison to cooking a full meal. Low sugar: There is less than one gram of sugar in each serving of this shake. There are no empty sugar calories in this shake and the energy it gives you is sustainable. Out of all the shakes on this list, this is the one with the second least amount of sugar, yet it is not bland or bitter like you would expect something without sugar to be. 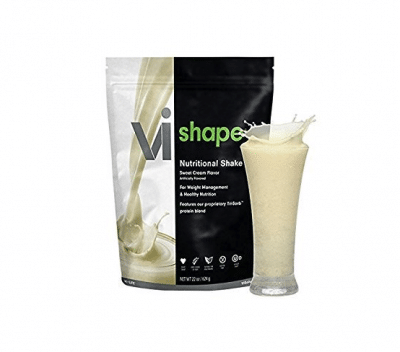 23 vitamins and minerals: Like CLICK, VI-Shape contains 23 vitamins and minerals that your body needs. The levels of vitamins and minerals slightly differ between the two, so it is worth comparing them if you are choosing from them. For example, VI-Shape contains 30% of the recommended daily intake of Vitamin A, while CLICK only has 25%. CLICK also has 25% of the recommended iron intake, whereas VI-Shape has only 5%, so it is important to compare the ingredients so that you can get what best suits your needs. 12 grams of protein: With only 90 calories per serving, packing in 12 grams of protein and still making it taste great is quite impressive. What’s great is that you can also easily have two servings at once, get almost 25 grams of protein, and still stay under 200 calories. Although, if you do this you will also go through the bag quicker. Promotes heart health: The protein comes from a blend of soy protein isolate, whey protein concentrate, and whey protein hydrolysate; soy protein isolate promotes heart health. It also contains a whole serving of fiber, which is known to have numerous cardiovascular benefits, including but not limited to improving cholesterol, and lowering the risk of heart disease and stroke. Processed to remove fat: The special process that this mix goes through is possibly the best part of the shake. A very large majority of fat and carbohydrates are removed from each of the protein sources, and lactose is removed completely. This is what allows this mix to have less than one gram of fat and sugar per serving. This shake is super tasty and makes a great addition to any smoothie. If you mix it into a smoothie with some fresh fruit, it is hard to even taste, but it is also good on its own. This makes it great for pretty much any time of the day, whether it be as a breakfast or as a post-workout recovery. The main downside is that it is somewhat expensive compared to others in this list. It’s worth the money, but if you are on a budget this may not be the best option for you. Reduce cholesterol: The ingredients in this shake are known to reduce cholesterol. According to the CDC, more than 102 millions have total cholesterol levels above the healthy amount, and 35 million people have such high cholesterol levels that they have a high risk for heart disease. If you fall into either of these categories, but you’re ready to get control over your cholesterol, Total Lean is a great choice. High-quality proteins and vitamins: Packed with high-quality milk protein, and a premium blend of vitamins and minerals, this shake makes a great meal replacement. They make great meal replacements when you are busy at work or on the go and would otherwise have to get greasy fast food. Oat based: Everybody knows oats are good for you, and they can play a huge role in helping you achieve your weight loss goals. The oats are packed with fiber, which helps fill you up and keep you fuller longer, which really helps with snack cravings. Fuels lean muscle: Total lean also fuels lean muscle, which gives you that tight, toned look. Lean muscle is muscle that is not obscured by fat; it is not hard to see why so many women want to gain lean muscle. I like to think of lean protein as like invisible strength. You are able to build up muscle and get strong, while still looking lean and without packing on tons of weight and having bulging muscles. Effective for weight loss: Total Lean fuels metabolism, which in turn promotes weight loss by burning calories faster. Also, since you are replacing an entire meal with a 180 calorie drink, possibly twice a day, you will be taking in fewer calories, thus also promoting weight loss. That’s not it though, as I mentioned before, the oats keep you full for a while, curbing the snack craving, and also promoting weight loss. In short, this shake has several things going for it that make it effective for weight loss. One thing I really love about this mix is that when you order it, you also receive a meal and exercise plan. Most other companies give you the shake and assume you know the rest, or just leave you to learn the rest on your own. In reality, a shake alone will not trim off 20 lbs., but when you use the shakes in conjunction with a healthy diet and exercise, you can probably finally shake those 20 lbs., and Total Lean helps you with that every step of the way. Another great aspect of this shake is that it comes in a stunning array of twelve different flavors. 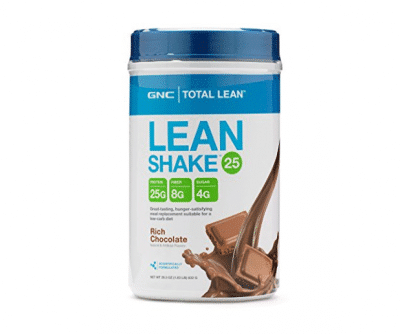 In addition to vanilla bean, Total Lean comes in the following flavors: banana, chocolate peanut butter, cookies and cream, French vanilla, mixed berry, natural chocolate, natural vanilla, orange cream, rich chocolate, snicker doodle, and Swiss chocolate. Some of the flavors have more calories than others. However, they are pretty much all in the 170 to 200 range. Another downside is that the vanilla bean has 200 calories and only nine grams of protein, whereas most of the other flavors have 25 grams of protein. I’m not sure why that gap exists, but in the big picture, it is a pretty insignificant drawback. Double shot of real espresso: If you can’t start your day without that cup of joe, this drink mix is probably the best choice for you. You can cut out all the empty calories of coffee and still get your shot of espresso in the form of this delicious energy drink. It’s not coffee flavored, or imitation coffee, it’s the real deal, right in the protein shake, which also makes for a great afternoon pick me up. Can be served hot or cold: Just like your favorite coffee house drink, this shake can be enjoyed warm, over ice, or even blended. There are tons of different things you can do with this mix, giving you lots of variety in your daily options. Drinking the same thing over and over every day can feel more like a chore, but this just feels like a cup of coffee or an ingredient in my morning smoothie. Boosts energy: The high levels of protein and vitamins, combined with the premium grade espresso give you the energy you need to get through the day. And with only 6 grams of sugar, you can be sure it isn’t just a sugar rush that you’re feeling that you will inevitably crash from. Low calorie: Two scoops of this powder can make a 14 oz. shake with 16 grams of protein and only 120 calories. To put that in perspective, a 1 oz. serving of potato chips contains 120 calories, and let’s be honest, who eats just 1 oz. of potato chips? This shake makes a much better snack alternative, it will fill you up better, and is way healthier. 23 vitamins and minerals: What really makes this shake a great meal replacement though, is its special blend of vitamins and minerals. If protein was the only nutritional benefit in this shake, it wouldn’t be worth it because your body needs much more. Vitamins and minerals such as biotin, copper, zinc, Vitamin A, B, and C are just a few of the many that your body needs and CLICK offers more of these vitamins than you would probably typically get in a snack, or even light meal. One of my favorite things about this shake, as I mentioned earlier, is that it is incredibly versatile. Not only can it be served several different ways, it also comes in three scrumptious flavors; caramel, mocha, and vanilla latte. This is great because it allows you to switch things up or if you already have a favorite type of coffee, you can get that flavor of mix. The espresso also helps you burn more fat because it is a natural thermogenic. It is also very easy to make and can be mixed with water, milk, or almond milk. All you have to do is dump a couple scoops in a shaker cup, with your base of choice, and shake it up. If you are lactose intolerant you will have to pass on this shake since it contains milk. It is also produced in a factory that also processes peanuts, tree nuts, eggs, wheat, sesame, and shellfish, so this probably isn’t the best shake for anyone with food allergies. Each serving of FitMiss Delight is packed with 16 grams of protein, which helps keep you fuller longer. And to go one step further, they’ve also included Solathin, a potato protein isolate, which is known to be even more effective at keeping you feeling full and suppressing cravings. High-Quality Blend of Ingredients: This protein powder features a high quality blend of fruits and vegetables, including apple extract, barley grass, blood orange, broccoli, strawberry, and cranberry extract, among other things. This special blend helps add a boost of vitamins and minerals to the powder, giving you more of the essential nutrients you need. Keto Friendly: If you’re one of the many people on a ketogenic diet, you may have found it hard to find a good protein powder that isn’t packed with cheap energy in the form of carbs. Fitmiss Delight has only 2 net carbs per serving, so it can accommodate a low carb diet. This is also nice because it lets you know that the energy your getting is pure, clean energy from a good source. Without a doubt, this protein powder is worth what it costs. Usually, protein powders with high quality ingredients cost way more, so it almost seems too good to be true, but it’s not. Instead of just giving your body a protein boost, it also gives it a boost of vitamins and minerals, so it can even replace an occasional meal. Lastly, it’s available in three delicious flavors, cappuccino, chocolate delight, and vanilla chai, so you can find your favorite flavor and stick with it or mix things up. The Vanilla Chai flavor isn’t great. There are 3 flavors and we only tried one, so this may not be a fair assessment, but the taste is very sweet. If you’re on the fence, maybe go for chocolate rather than Vanilla Chai. 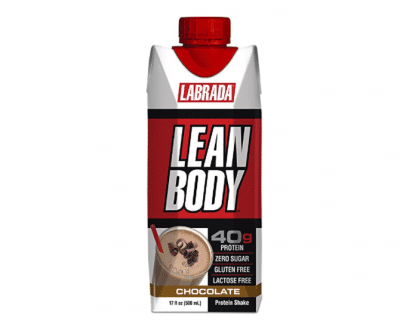 High protein: This whey protein shake from Labrada, easily has the most protein out of any shake on this list. It has a whopping 40 grams of protein per serving and only a mere 280 calories. I’m not totally sure how they did it, but if you are looking for sheer protein levels, this is the best shake you can get. Zero sugar: This shake is also totally sugar-free and only has nine grams of carbs. Instead of relying on sugar to mask the taste and make the drink palatable, like several other proteins shake, Lean Body RTD relies on natural and some artificial flavors, that taste great on their own. 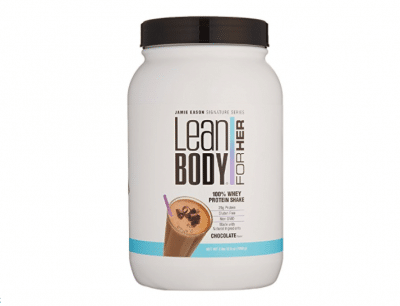 Gluten and lactose-free: Lean Body RTD is also usable by most people since it is gluten and lactose-free. It can be hard to find a decent protein shake that is gluten and lactose-free, but here is one of the best ones on the market, and it’s totally gluten and lactose-free. Curbs cravings: The 40 grams of protein fills you right up and curbs those unhealthy cravings. Lean Body RTD is a great afternoon meal that allows you to, instead of stuffing your face with junk food, gets 80% of your recommended protein intake for the day and a boost of energy. 8 flavors: Lean Body RTD also comes in eight different flavors, so there is something for everyone. The flavors include: bananas and cream, café mocha, chocolate, cinnamon bun, cookies and cream, salted caramel, strawberries and cream, and vanilla. Some of the more sinful flavors, such as cinnamon bun, are still just as healthy as the plain vanilla and can be a great way to satisfy your sweet tooth in a healthy manner. Unlike my other picks on the list, Lean Body RTD comes pre mixed and inconvenient, portable bottles. This makes it a breeze to just grab it on your way out the door, or anytime you are in a hurry. All you have to do is give it a good shake before you open it, it’s as easy as that. This shake only comes in packs of 12, so one pack will not last you very long. However, because there is so much protein in a single shake, you can get away with only having one per day, instead of two per day like most other shakes. This will make it last a little longer, but you will still need to get more in about two weeks. Artificial sweeteners, like the aspartame I previously mentioned, can be hard to avoid while on a diet. Many diet foods substitute artificial sweeteners for sugar, but this doesn’t put everyone at ease. Lots of people do not trust artificial sweeteners, either because they are unnatural or because of reported side effects. Either way, it is not something you have to worry about because Her does not contain any artificial sweeteners. Her Natural Whey is sweetened naturally using the stevia plant. rBGH Free: The whey protein within this powder is extracted from milk of only grass-fed cows. The cows are all free of recombinant bovine growth hormone. rBGH is naturally produced in cows, like human growth hormone is naturally produced in humans, but like with HGH, when you start injecting more growth hormone, the risks also increase. rBGH can cause mastitis and other painful infections in cows. It is banned in several countries around the world, although not America, and has been loosely linked to several types of cancer and diabetes. Needless to say, I can breathe a sigh of relief knowing this powder is rBGH free. Supports Weight Loss: Because these shakes have so much protein, they do a really good job of filling you up and giving you natural energy. This makes them a great meal replacement, and since it has much fewer calories than your average meal, it supports weight loss. However, relying solely on this powder for weight loss is foolish, you have to use it in conjunction with a good diet and exercise regime for the best results. Low Fat: Like sugar, fat should not have a place in quality protein powder. Thankfully, there is very little fat in each serving of Her. Fat has a whopping 9 calories in every single gram, which can add up quick. With only 2 grams of fat per serving, the 18 calories are almost negligible and can be burned off naturally throughout your normal daily routine with just a few minutes of walking. My favorite thing about this powder is that it is made specifically for women and is a great energy boost. Best of all, because there is very little sugar, the energy it gives you is sustainable and won’t cause you to crash in a few hours. It makes a great pre-workout shake to get you ready for your workout, and a great post workout shakes to help your muscles start recovering faster. The point is, they’re good for pretty much any time of the day. Her Natural Whey Protein has almost everything you could ask for in a protein powder, but it comes with the fewest number of servings of any powder on this list. I believe it is worth the money, but it is inconvenient to have to stock up more often than you would with other powders. 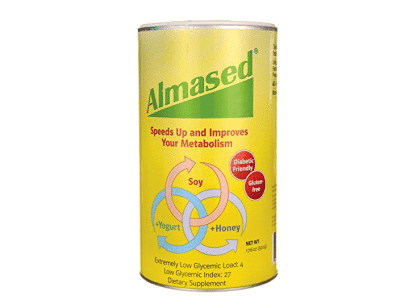 High in protein: This protein powder from Almased is packed with 27 grams of high-quality protein and only has 180 calories. The main source of protein in this shake is soy protein, which has several health benefits itself. There is also protein from skim milk and yogurt powder, pushing the total protein count up to 27 grams. This also gives you long lasting energy that leaves you feeling better and not sluggish. All natural: With all natural ingredients, like honey enzymes, you can rest easy knowing there are no weird chemicals or anything. It is also gluten-free and vegetarian-friendly, making it great for practically everyone. It also contains no stimulants, which means you are getting all your energy from natural sources and will not experience any of the side effects associated with stimulants, like jitteriness. Helps burn fat, not muscle: This protein powder works to speed up your metabolism, which makes it so you burn fat instead of muscle. This is great because it helps you do more than just lose weight, it will also make it easier to build up your muscles. Other diet programs that just focus on losing weight and are only concerned with the number on the scale may make you lose weight, but a lot of it will probably be in muscle, meaning you will be lighter, but you will probably also be weaker. Unique fermentation process: What sets this mix apart is its unique fermentation process. The fermentation allows the nutrients in the mix to be absorbed easier by your body when you consume it. You can have a shake with a combination of all the greatest nutrients you could think of, but if your body cannot absorb them, they are useless. Supports immune and digestive function: On top of just replacing a meal and giving you energy, this protein powder also boosts your immune system and promotes digestive function. Using honey enzymes and probiotics, this shake will help make sure everything is running correctly in your digestive tract and help fight off diseases. Meaning, this powder helps keep you healthy in more ways than one. One of my favorite things about this powder is that it is all natural, meaning you are getting all natural energy, which lasts much longer. There is also no “crash”, like there is with sugary sources of energy. This mix allows you to get a protein and energy boost, while still feeling like yourself and without any negative side effects. Another great thing about this powder is that it is super easy to make and can be done in seconds. You can easily make it before you walk out the door in the morning, or while you are on a break from work, either of which is great times for a weight loss shake. Unfortunately, there are only 10 servings in each pack. However, it is not too expensive. You can also buy them in different sizes, including a 2-pack and 3-pack. I recommend starting off with a single pack to see if you like the taste and go from there. This whey protein isolate prides itself on his wholesome, natural ingredients. It contains no artificial colors, artificial flavors, artificial sweeteners, or preservatives. Trusted Brand: If you are a fitness nut, you probably already know who Jamie Eason is. But if you don’t, get ready to listen up. Jamie is a fitness model, who has been featured on tons of magazines, and a former NFL cheerleader. However, her most impressive feat is winning the title of World’s Fittest Model. It’s easy to assume she knows a thing or two about fitness, which makes her signature line of protein powder easy to trust. Fiber: This protein powder contains 3 grams of dietary fiber per serving, which doesn’t sound like a lot, but is actually a pretty good chunk of the recommended daily intake. 3 grams of fiber is 12% of the recommended daily amount of fiber for someone following a 2,000 calorie diet. However, the amount of fiber you personally need may vary depending on if you consume more or less than 2,000 calories daily. If you are looking to get all your daily fiber in one smoothie, using one serving on this powder and 2 ounces of chia seeds will give you 92% of the fiber you need for the whole day! 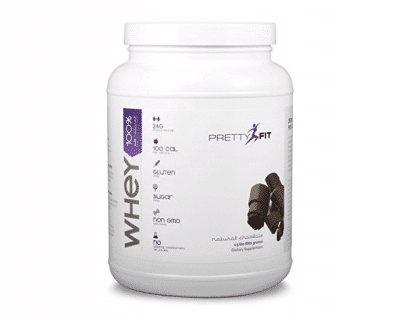 Pleasant Taste: This whey protein contains no lactose, but still retains the delicious creamy taste everyone loves. It also comes in 2 other flavors besides vanilla, including chocolate and cookies n cream. This gives you a couple of different options to try without overwhelming you. Although it wouldn’t be considered a top feature, its portability is definitely a huge pro. This powder can easily be mixed right in your water bottle and taken with you on your way out the door. You can drink it at any time of day as a snack or meal replacement, or if you mix it with water, you can sip on it throughout the day. The main drawback of this powder is that it is the most expensive powder per serving. At $2.13, and only 17 servings, it isn’t the most wawallet-friendly option. The cookies n cream flavor tends to be cheaper if you are on a budget and flexible on your flavor options. Sugar-Free: As we have already discussed, sugar is just empty calories. Whether you are trying to tone up, lose weight, or just maintain where you are at, sugar has no place in protein powder, and this PrettyFit powder proves it. This whey protein isolate contains zero grams of sugar and less than one gram of total carbs, so you can be assured that there are no empty calories in it. All Natural: My favorite thing about this powder is how dang simple it is. It contains five ingredients, that’s it, non-GMO cold processed ultra micro-filtered whey isolate, cocoa natural flavors, xanthan gum, stevia, and a digestive enzyme blend. None of the other powders have such a condensed ingredient list; this is probably the best choice for people who are all about transparency and natural ingredients. Added Digestive Enzymes: The enzymes in this powder are a mix of Protease I, Protease II, Amylase, Lipase, and Lactase. Some of the names may seem intimidating at first because they’re new, weird words, but you can always tell they are just enzymes by their –ase ending, which all enzyme names have. So if you ever see these ingredients on another powder, you know that they aren’t bad chemicals, just enzymes. These are all digestive enzymes meant to aid in digestion and increase absorption of the protein. Good Source of Calcium: This whey isolate is tied with the next one for the most calcium in a serving. This powder contains 25% of your daily calcium needs, easily beating 3 of the other powders. I was really surprised when I saw that only two powders have a good helping on calcium in them. Since whey protein is extracted from milk, I thought they would all have at least a decent serving of calcium, but to my surprise, this was not the case. This protein powder does not have a strong, herbal or medicinal taste that some protein shakes tend to have, although not any of the ones on this list. When you drink it mixed with your choice of milk, it has a pleasant taste that blends with the creamy texture of milk. It also tastes great in plain ol’ water, or even in your favorite juice. You can also add this protein powder to most dishes, especially while baking, for a healthy protein boost without losing any of the dish’s original taste. The only thing I do not like about this powder is the lack of flavor options; it only comes in natural chocolate and natural vanilla. However, I think if they started doing a lot of different flavors it would be very difficult to continue using all natural ingredients. After all, it would be pretty difficult to make birthday cake or mocha protein powder without using artificial flavors. They stick to their priorities, and I appreciate it, so for that reason, I don’t really mind the lack of flavors. While whey isolate and concentrate come from the same source, there are a few key differences. They are both effective forms of protein, but whey protein isolate is slightly purer. It is filtered more than whey protein concentrate, so virtually all of the lactose and fat is removed, making it a good choice for people with a lactose sensitivity. Also, whey protein concentrate powders tend to be between 30% and 80% protein, whereas whey protein isolate is usually 90%+ protein by volume. Those looking for “pure” protein and nothing else will want to go with an isolate, however, since isolate goes through additional filtering and is more difficult to produce, it is also more expensive. Protein will keep you feeling fuller for longer while boosting your metabolism to help you burn fat. All of the shakes recommended are packed with protein, but if you do not like any of them and decide to find one for yourself, make sure there is at least 10g of protein per serving. You should also look for shakes with added vitamins and nutrients. Remember, these shakes are supposed to replace meals, so you want a shake that fill in those nutritional needs you would normally get from fruits or vegetables. You will also want to consider what type of protein you want. Two of the most common forms of protein used in shakes are whey and soy. They both have their own advantages and disadvantages. Whey is the most widely used protein powder because it is very effective, however, it can cause gastric distress for some. If you’re lactose intolerant, you may want to consider soy, hemp, egg, or collagen protein. There is no shortage of options out there. Consider your dietary needs while looking for a shake. If you are vegan, lactose intolerant, gluten intolerant, or soy intolerant, there is a shake that will suit all of your needs. This is very important because protein shakes can be somewhat pricey, so buying one and then realizing you can’t eat it due to an allergy would be incredibly frustrating. I also recommend looking for a shake with very little sugar. Despite whatever your personal dietary needs may be, a shake loaded with sugar will not help you lose weight. Some of the biggest shakes on the market have sugar as the number one ingredient, which is why they did not make it on the list of recommended shakes. Lastly, it is always a good idea to do some comparative shopping. This can help determine the most affordable shake per serving, which may be a deciding factor if you are on a budget. Along the same lines, I also recommend using any coupons or discounts you can find because why pay more when you can pay less. All of these shakes are great, and you should make your own educated decision on which one to get. Like I said earlier, it is important to compare the different products and see how they measure up to your personal needs and desires. That being said, my personal favorite is the CLICK Coffee Protein. To me, this one is the best because it not only helps eliminate hundreds of unnecessary calories from my daily coffee routine, it also lets me keep the great taste of coffee that I love. 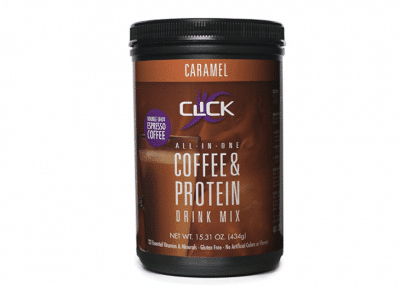 It does not taste exactly like regular coffee, but the coffee taste is the strongest taste in the shake and I am able to get the same energy as I used to from coffee, while also getting a bunch of protein and other nutrients. Basically, any time you would have a cup of coffee, you can make a shake, which will satisfy your cravings in a much healthier way. Even in the summer, when you want an iced coffee, this shake has your back, which is why it is the winner.